The Cultural Demonstrator Program at Petrified Forest National Park provides the opportunity for regional people to share their history and traditional crafts in the dynamic setting of Petrified Forest National Park. Through cultural demonstrators, we can recognize the ancient peoples, intertribal relationships, European-descent cultures and even Route 66 history. Scheduled cultural demonstrators and other events are shown in the calendar below. Click on the day for location of event and more information, if available. The schedule is subject to change. 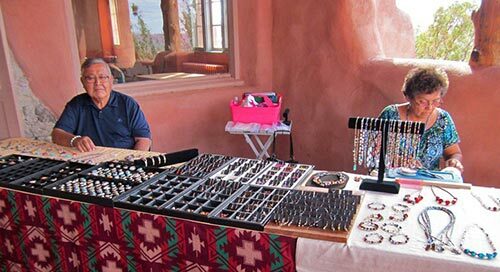 Cultural demonstrators also set up periodically in the Painted Desert Diner so you can observe the artisans craft their beautiful wares while you enjoy your meal and perhaps purchase a treasure of your own.